A mistake that a lot of gardeners make when it comes to planting is not leaving enough room for their plants to spread out during growth. But when you plant crops in wide beds, it actually cuts down on weeding, conserves water, allows the compost to be concentrated where it will do the most good and improves soil structure for future years. Choosing the right mulch is sometimes confusing for gardeners, especially if it's their first time growing a garden. The purpose of mulch is to moderate temperature, conserve water and avoid any type of soil borne disease from getting to the produce. When buying mulch, look for an organic kind that will rot down into the soil. The growth of a plant depends on the health of the roots which get their nutrition from water and soil. Depending on the type of soil you use, for some it could be a matter of just not providing enough nutrients. If you're using soil rich in matter such as compost, you're going to get the most out of your soil and provide your plants with the best opportunity for healthy growth. 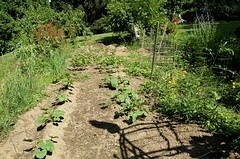 One of the most important and best tips for growing a bountiful garden is to be watchful and observant. Just like any other living thing, gardens need to be watched and tended to. Regardless of how busy your schedule may be, you have to understand that growing a garden is a commitment and if you're not willing to put in the time, you're not going to see results. Monitor the changes in your garden and recognize if things don't look right and you'll be able to make appropriate changes before it's too late. Truth be told, gardening isn't as difficult as it may appear to be. By doing your research and understanding how plants grow and where they absorb the nutrients needed for growth, it could make a world of a difference. In case you need guidance, follow these tips to keep you on track and you should have a healthy garden in no time! Janelle Rivera has a strong passion for protecting the planet. She has even taken the extra steps to help build awareness for going green. She is now researching programs such as an llm degree to learn more about saving the environment.